After watching Bill Wurtz's History of Japan video, it got me wondering. At 4:38, it brings up the Dutch bringing geography to Japan (obviously, this is a humorous video, so I'm sure this is simplified), but it shows a map of the world (presumably) as the Dutch understood it in the mid-17th century. Would an average educated Japanese person at that time have recognized their island system on a world map, or been able to locate it on a European map? If not, when would such geographical knowledge have been common? 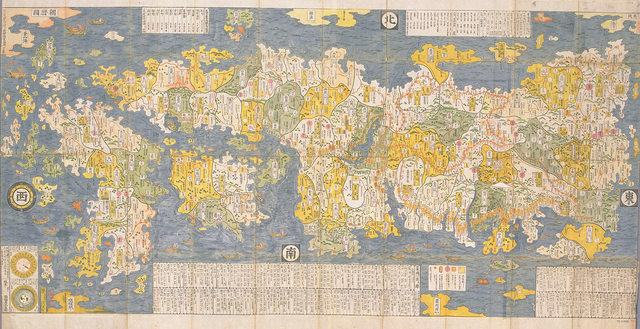 Wikipedia mentions early Japanese map-making, but it seems to have been mostly local mapping, nothing on the scale of the islands themselves. All the maps I have found have been European-made, which doesn't tell me much about what the Japanese knew, and the Wikipedia page doesn't have any pictures. Realistically speaking a reasonably knowledgeable Japanese person would've been able to spot Japan on a world map, based on the islands' relative position to Korea and China. This is probably true since at least the 400s. They were, after all, able to engage in extensive trade and diplomacy with the mainland. Their grasp of geography couldn't be that far off if they could sail back and forth. This is of course quite different to actually knowing what the islands look like. In terms of recognising the actual shape of the Japanese isles, a vague recognition may date to about the 700s. The borders of Japanese provinces were largely set between the Taika Reforms beginning in 645, and the promulgation of the Taihō Code in 701. From court records, it is known that maps were drawn up for the freshly-minted provinces and collated at the capital. 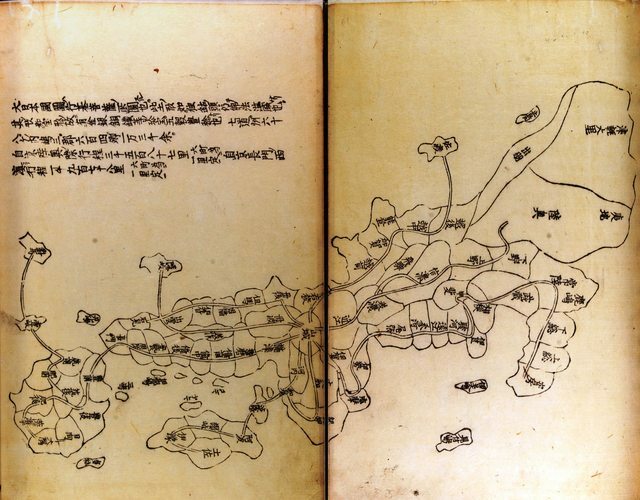 The earliest known map of Japan is the Gyōkizu (行基図), supposedly created by the Nara-era monk Gyōki (行基) (A.D. 668 - 749). In actuality, the earliest documented version of Gyōki's namesake map was created in 805. Moreover, the original is long lost. The oldest surviving copies were made only as late as the Edo period. 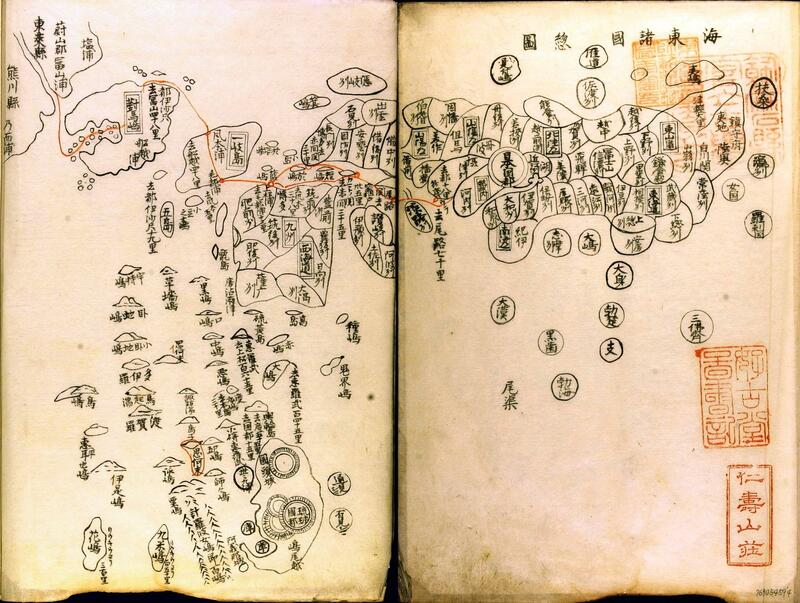 For example, the following map is found in a 1656 reprinting of the medieval Compendium of Miscellanea shūgaishō (拾芥抄), an encyclopedia created in the late 13th century. This is obviously an incredibly crude map, though one may recognise a general resemblance to the Japanese archipelago. While the extant copies are from the 17th century, the shūgaishō is known to have been created as early as 1291. On this basis, educated Japanese elites may have known (very roughly) the shape of their homeland from at least the 1200s onward. A similar Gyōkizu style map of Japan is seen in a 1471 Korean publication, 海東諸國紀, which is thought to have been based on a 1453 map provided by a Hakata merchant. Not the answer you're looking for? Browse other questions tagged japan maps medieval-japan cartography or ask your own question.